Several Chicago aldermen are partnering with airport employees’ union to take control of the city’s airports from city hall. Alderman Scott Waguespack and several other municipal officials, along with the Service Employees International Union (SEIU), proposed the creation of the “Chicago Airport Authority” on May 17. The proposal suggests an independent, elected board to oversee airport operations, management, and contracts for the O’Hare International and Chicago Midway airports. Chicago airports are under the Chicago’s Department of Aviation (CDA) jurisdiction—and the CDA is under Mayor Rahm Emanuel‘s control. The CDA released a statement on the same day, saying the plan was “backwards in its approach,” according to The Associated Press. The resolution would place an “advisory referendum” on the November 2016 municipal ballot for voters to decide on who should have control. 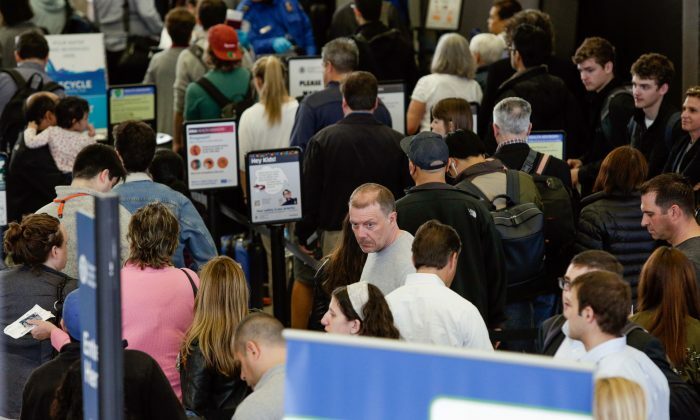 On May 15, 450 American Airlines passengers missed their flights due to Transportation Security Administration (TSA) checkpoint lines clocking two hour plus wait times at O’Hare. Dozens of passengers who could not secure seats on later flights were stranded in American Airlines’ Terminal 3 overnight, sleeping on cots. The CDA changed its recommendations to passengers on May 17. Passengers flying out of O’Hare and Midway airports are encouraged to arrive three hours ahead of their scheduled departure time—even for domestic flights—to allow enough time to pass through TSA checkpoints. During March this year, O’Hare had a total of 72,954 aircraft passing through and a total of 6.3 million passengers—mostly domestic—according to airport data. American Airlines staff began handing out cots and blankets just after 9:30 p.m. Central Time. An ongoing TSA staffing shortage has affected air travel nationwide and has led to infuriating delays.